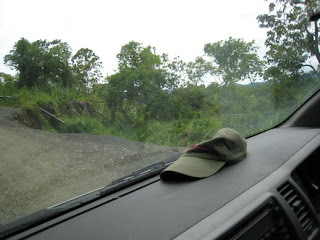 I’ve finally gotten around to posting some pictures of our trip to Madang. Sorry for the delay. That’s the problem with coming back from a vacation – work just keeps piling up while you are gone, and you have to play catch-up when you get back! 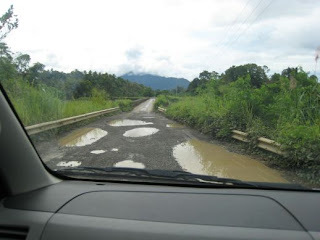 A major part of our road trip experience was the road itself. 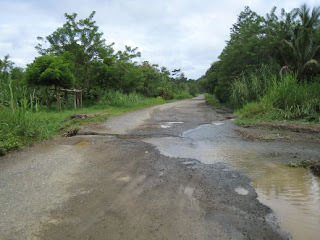 After all, it took us almost 5 hours to drive from Ukarumpa to Madang. 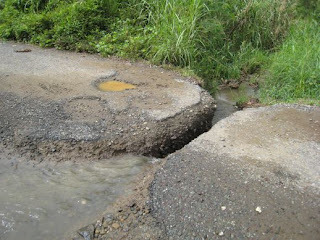 While PNG is blessed with a great number of wonderful things, it’s lacking a lot of infrastructure (like roads, and the means to keep them in good repair.) Some sections, recently re-done by a mining company, were very nice. But without warning, the roads could turn bad very quickly. Since a picture is worth a thousand words, here a few for you. It’s hard to see in the photo below, but this shows one of the areas where you are warned by a sign that one lane is closed ahead, and when you round the turn, you see why – a whole chunk of the road has fallen down the mountain! Is this the same mother that died last week?